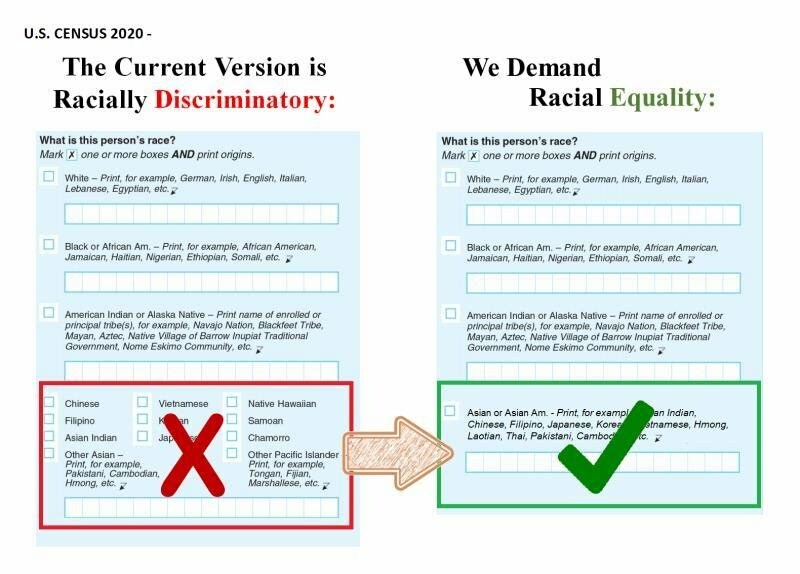 I urge the Bureau to change the format of the race question by removing Chinese, Vietnamese, Japanese, and other sub-Asian checkboxes, and replacing them with a generic Asian/Asian American checkbox. This is the least you can do to ensure that Asian Americans are treated equally as white and black Americans. 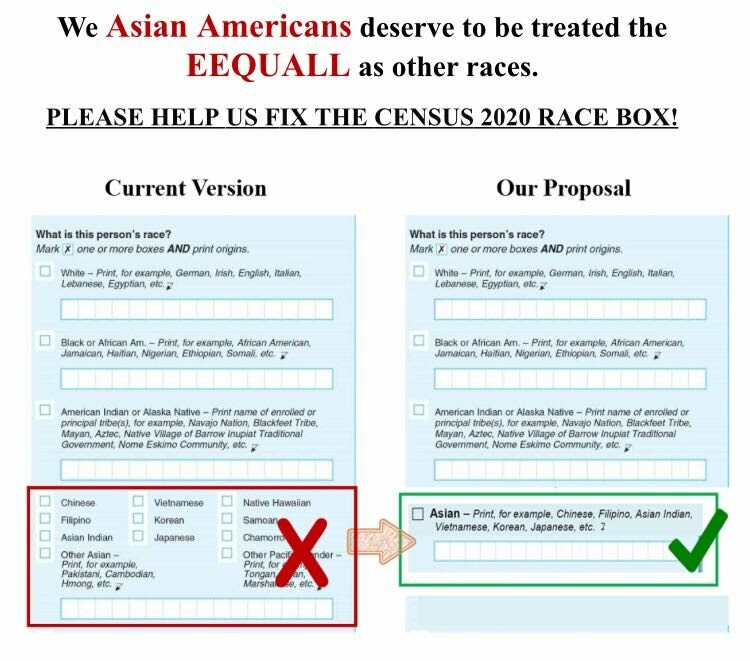 Remove sub-Asian boxes on Census Form 2020! Stop racist anti-Asian anti-immigrant legacy! "今天去参加白宫AAPI community leader forum, 我临时换到了census 讨论组。有人提前做好了flyer (见下 ), 有7个从美国各地赶来的华人强烈要求 Asian American receive the same treatment as other race group. We want the Asian race box parallel to White and Black race group." "目前census的设计白人，黑人都有 White or Black 的大box可以选，自己想填祖上是哪里来的可以填，也可以不填。但亚裔没有同样的选择，直接就得选Chinese, Korean等等。Asian American has been treated differently. 想一想我们儿子孙子辈的，在美国土生土长，他们还会identified as Chinese吗？有些州搞亚裔细分，支持者的理由之一就是联邦人口普查就是这样分的啊。"
"今天现场有两个census派来的官员。我在现场听她们讲话才意识到有一个可以反击他们的高大上的理由。她们很care response rate, 希望everyone will be counted. 也希望通过community/church等多种途径鼓励更多的人填表。We can say our community has big concerns about the design of the census form，therefore a lot of people are reluctant to fill it up. 我也提到二战期间census提供了信息帮助把日裔美国人关到集中营去。我问她们怎样保证confidentiality and history does not repeat itself? 她们说census office will follow the law and safeguard the data." 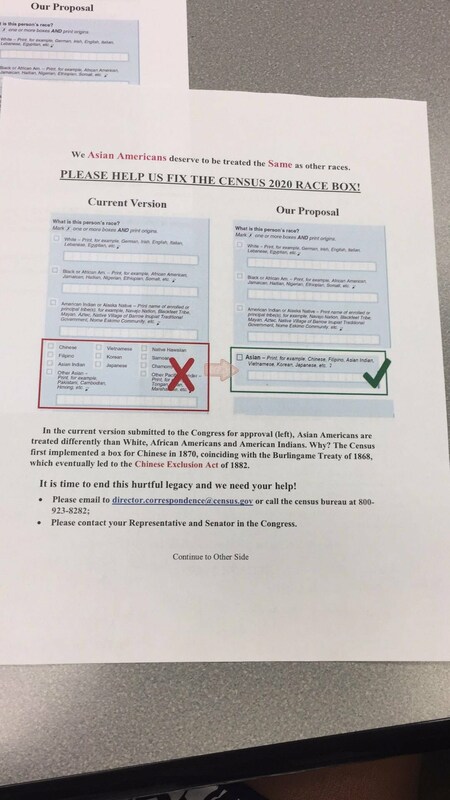 （Intruduce yourself）, I am writing to express my concern about the race question in the 2020 census. my concern is about the format of the question, instead of the content of the question. For Asian American and Pacific Islanders (AAPI), there are multiple boxes to click. 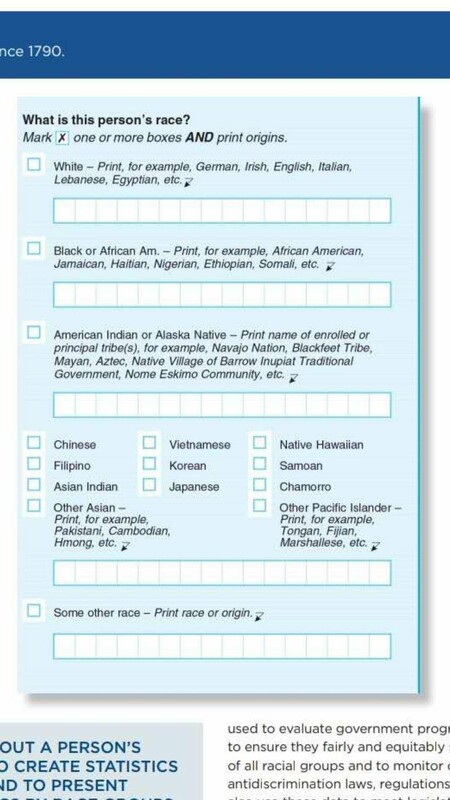 By contrast, for other races and ethnicities such as Black, White, or Native Americans, respondents have with one write-in box for each race-ethnic designation. I believe the extra Asian boxes are harmful to the AAPI community in the following ways. 1. Continuing the legacy of the Chinese/Asian Exclusion Act. 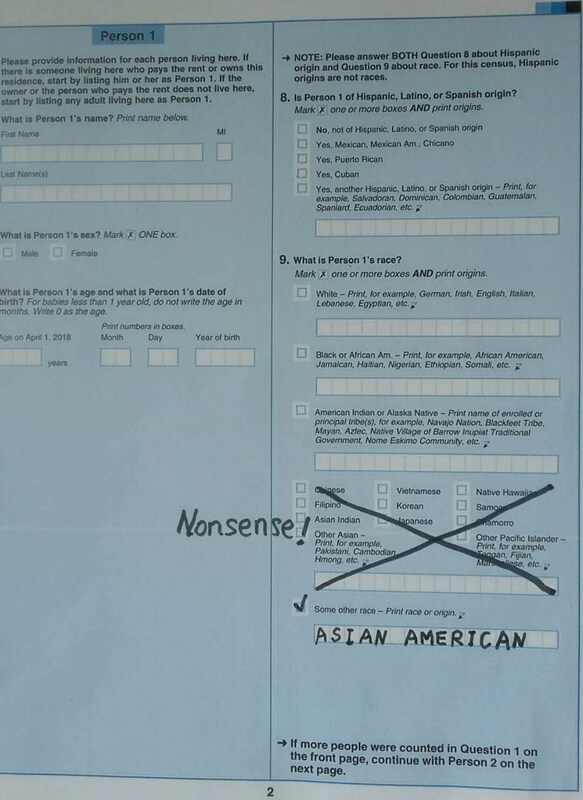 The Census first implemented an Asian special race box in 1870. Persons of East and Southeast Asian descent were first all called “Chinese,” irrespective of whether they actually came from Imperial China or not (the word “Chinese” first appeared in 1870 Census). In later censuses, ethnicities based on country of origin such as Japanese (1890), Filipino (1930), and Korean (1930) were created and added, and each new category served a political reason or was used as a tool to practice immigrant exclusion before the civil rights movement in the 1960s. For example, on April 3rd, 2018, Washington Post reported that information from the 1940 Census was secretly used to help sending Japanese Americans to internment camps in WWII (“Secret use of census info helped send Japanese Americans to internment camps in WWII” by Lori Aratani). It is time to end this hurtful legacy and further unify the AAPI community. 2. Casting the smaller AAPI communities as the “other.” The current census question alienates AAPI community members who do not belong to one the largest nine groups. It is a way of implying that some ethnicities are not as important as others. pertinent information about many AAPI community members. 4. Perpetuating the stereotype of Asian Americans as "forever foreigners. "Asians are considered less American than Black, White, and Native Americans. This census race question again defines us differently from other racial groups, and ignores the nuanced interconnectedness among AAPI communities. 5. Making Asians inferior. The current format implies that without the extra boxes as guidance, Asian people will not know how to answer the question properly. We know some scholars already have expressed concerns that some respondents may click Asian, then skip the print details section. However, this assumption is particularly troubling and racist, because it makes Asians inferior. If people in other racial groups know how to click a box then print, Asians know as well. Our suggestion is to treat groups equally: One Asian, One box to print. 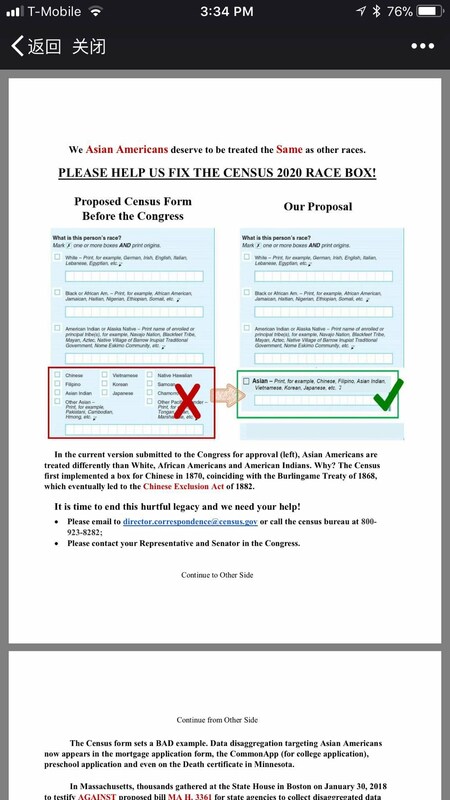 We urge Census Bureau to change the collection of data from persons of Asian origin to be identical to the way that White, Black, Native American data are collected. In 2017, the Census Bureau released an earlier version with the equitable format, and it has been tested and proved to be effective. However, the final version changed back to the multiple boxes practice. The One Box approach is more culturally sensitive and statistically meaningful. It will not increase the cost to the Census Bureau. It will also reduce the potential confusion.